Abstract: Psoriasis is a chronic inflammatory disease affecting up to 3% of the general population. The prevalence of nail involvement in psoriasis patients varies between 15% and 79%. While the nails represent a small portion of the body surface area, psoriasis in these areas can have a disproportionate influence on a patient’s physical and psychosocial activities. Differential diagnosis between an onychomycosis and a psoriatic nail could be challenging; nevertheless, coexistence of onychomycosis and nail psoriasis also occurs and both are common disorders in the general population. Nail psoriasis can be difficult to treat. Treatment of nail psoriasis should consider the body surface area of skin disease, psoriatic arthritis, severity of nail disease, and the impairment in the quality of life. All patients should be tested for onychomycosis before starting a therapy. This recommendation is underlined by the fact that nail psoriasis is mostly treated by immunosuppressive drugs, like steroids, methotrexate, or biologics, which may aggravate mycotic nail infections. Conventional systemic therapy, such as use of steroids, cyclosporine, methotrexate, and retinoid in the long term, can cause organ toxicities. Currently, use of apremilast and tofacitinib favors an early healing of nail psoriasis because they act directly on the pathogenic targets, distressing the inflammatory signals associated with the initiation and maintenance of the disease activity, and as with several conventional synthetic disease modifying antirheumatic drugs, they are characterized by the convenience of oral administration. The number of treatment options has increased considerably in recent years; however, given the heterogeneity of the disease, the therapy should be personalized to individual cases. Figure 1 The cytokines axis in psoriasis. IL-23-, IL-17-axis-related mediators are overexpressed in lesional psoriatic skin and nails. TNFα−/iNOS-producing dendritic cells (TiP-DCs) are activated by various cells and stimuli including Candida albicans. Candida activates Th17 and Th22 to produce IL-22 and IL-17A/F. Keratinocytes are the key-responding cells to this pathway. Abbreviations: VEGF, vascular endothelial growth factor; IL, interleukin; TNF, tumor necrosis factor; iNOS, inducible nitric oxide synthase; KC, keratinocytes. Therapeutic management is based on clinical presentation, as well as patient-related factors. Most patients have mild nail psoriasis without arthropathic disease or severe skin psoriasis.28 These patients may be suggested topical therapy, while systemic therapy is suggested in patients affected by severe nail psoriasis and in those with major impact on QOL or with moderate-to-severe psoriatic skin lesions or PsA. Age, burden of disease experienced, comorbidities, individual patient medication preferences, and risks of treatment should be considered for the treatment strategy. Recent studies have shown that 1,25(OH)D values are significantly lower in psoriatic patients than in control healthy subjects.47 Vitamin D3 derivatives appear to be more successful in treating nail bed psoriasis than nail matrix.47 Tazarotene is a retinoid that has been shown to have antiproliferative, differentiation normalizing, and anti-inflammatory effects, and it is also approved for the treatment of psoriasis.48–53 Topical calcineurin inhibitors such as cyclosporine and tacrolimus are effective in treating both nail matrix signs of nail psoriasis (pitting) and nail bed signs (hyperkeratosis, onycholysis, crumbling, and oil-drop discoloration). No local or systemic side effects were reported during the clinical trial except for a yellowish discoloration after long-term application of cyclosporine. Acitretin, which belongs to the retinoid family, regulates cellular differentiation and also possesses anti-inflammatory properties. Acitretin has been shown to have a moderate efficacy particularly on nail signs of psoriasis, although its efficacy is limited by common side effects including cheilitis, dry mouth, and skin exfoliation.61,62 New molecules have been studied to improve the QOL of psoriasis patients focusing on the new discoveries. Psoriasis is characterized by anomalous immune response and determined by self-cytokine networks.63 The importance of these adverse effects has stimulated the development of new therapies characterized by high affinity and a safety profile. Infliximab, a chimeric anti-TNF-α immunoglobulin (Ig) G1 monoclonal antibody that consists of human antibody constant regions and murine variable regions, was approved for PsA and plaque-type psoriasis in 2005/2006. Several studies have shown the valuable effect of infliximab on nail psoriasis – both nail bed and nail matrix psoriasis. Also in patients with severe nail psoriasis at baseline, an excellent degree of response can be achieved after 22 weeks of therapy.65 The data indicate that infliximab is effective for psoriatic nail disease in the context of severe skin and/or joint involvement. Etanercept is a fusion protein of the TNF-α receptor and Fc end of the IgG1 antibody. Barrera et al reported an average reduction of 51% in the NAPSI score in 562 patients enrolled in this study after 54 weeks of therapy.67 The efficacy of etanercept on nail psoriasis was evident after 24 weeks of treatment, with greater improvements observed after 48 weeks.68,69 In conclusion, treatment of nail psoriasis with etanercept should be considered in the context of treating moderate-to-severe psoriasis with the aim of achieving improvement of both skin and psoriasis nail lesions. Golimumab is a human monoclonal anti-TNF-α antibody. The randomized controlled trial, GO-REVEAL study, showed a mean NAPSI improvement of 52% at 52 weeks.70 Substantial improvements in nail symptoms, evaluated by the NAPSI and physician’s global assessment of psoriatic nail disease, were observed in golimumab-treated patients as early as 24 weeks and were preserved or improved through 52 weeks.70 Golimumab should be considered in patients with nail and joint involvement as an advantageous treatment strategy. Certolizumab pegol is a humanized mouse monoclonal antibody to TNF-α that is chemically modified by PEGylation, and consequentially it has a prolonged half-life in patients. Certolizumab confirmed the NAPSI improvement of the other anti-TNF drugs, the clinical trial showed that the NAPSI change from baseline at week 24 was −52% with certolizumab pegol 200 mg every 2 weeks and −59% with certolizumab pegol 400 mg every 4 weeks versus −32% with placebo.71 Certolizumab pegol should be considered in patients with nail and joint involvement. Advances in understanding the pathogenesis of the disease have led to the development of new treatment strategies.72,73 Immunological research has recently pointed out the central role of IL-17 and IL-23 in the pathogenic pathway of psoriasis. Based on the evidence available, regarding the role of Th17 cells in psoriasis and psoriatic arthritis, three therapeutic agents against IL-17A have been developed: secukinumab, ixekizumab, and brodalumab. Significant reductions in NAPSI scores were observed using ixekizumab as early as 2 weeks, through 20 weeks, and in an open-label extension.81,82 Complete remission of nail disease was achieved in a high proportion of patients: 43% at week 44 and 51% at week 68.82 Although few data are available, due to the recent approval of the drug, ixekizumab should be considered in patients affected by severe skin psoriasis. ESTEEM 1 and ESTEEM 2 evidenced a target NAPSI improvement of 43% and 60%, respectively, after 32 weeks of therapy, which was maintained through week 52.84,85 Apremilast has been shown to be efficient in the treatment of both nail matrix and nail bed psoriasis (Figure 2). Furthermore, apremilast was generally well tolerated during Phase III clinical trials, and in particular, most adverse events were mild or moderate in intensity and the incidence rate did not appear to increase over time.44 The convenience of oral administration of apremilast is associated with its safety profile, and the tolerability of the side effect profile makes this medication an attractive choice for clinicians.83,84 Apremilast should be considered in patients with joint and skin involvement. Apremilast is not only effective for moderate-to-severe psoriasis or PsA but it is also characterized by a good safety profile and does not require laboratory monitoring as with traditional biological agents. Figure 2 Patient affected by nail psoriasis at baseline (week 0). The same patient after 12 weeks and 24 weeks of treatment with apremilast. Tofacitinib is an oral Janus kinase inhibitor that recently has been investigated for psoriasis. Papp et al during Phase III studies described significant dose-dependent improvements in the NAPSI score with tofacitinib treatment in patients affected by nail psoriasis, suggesting that the JAK pathway is a critical therapeutic target of the disease.86 It also offers the convenience of oral administration. In conclusion, oral tofacitinib is an effective, well-tolerated treatment option for moderate-to-severe chronic plaque psoriasis. Currently, two recent meta-analyses – regarding adalimumab, etanercept, golimumab, and infliximab – showed that differences in terms of efficacy of these drugs cannot be demonstrated.87,88 Additionally, in one of these studies, no significant differences in terms of safety of these drugs were established.87 Though the mechanism of action of the anti-TNF biologic drugs is similar, some molecular differentiations might justify the successful switch from one to other. Further investigations including prognostic biomarkers and patient stratification are necessary to allow clinicians the possibility of making better use of various biologic and non-biologic treatment options available. Parisi R, Symmons DP, Griffiths CE, Ashcroft DM; Identification and Management of Psoriasis and Associated ComorbidiTy (IMPACT) project team. Global epidemiology of psoriasis: a systematic review of incidence and prevalence. J Invest Dermatol. 2013;133(2):377–385. Gordon KB, Strober BE. Understanding therapeutic pathways and comorbidities in psoriasis. Semin Cutan Med Surg. 2014;33(2 Suppl 2):S20–S23. Davidovici BB, Sattar N, Prinz J, et al. Psoriasis and systemic inflammatory diseases: potential mechanistic links between skin disease and co-morbid conditions. J Invest Dermatol. 2010;130(7):1785–1796. Gottlieb AB, Dann F. Comorbidities in patients with psoriasis. Am J Med. 2009;122(12):1150.e1–e9. Gisondi P, Ferrazzi A, Girolomoni G. Metabolic comorbidities and psoriasis. Acta Dermatovenerol Croat. 2010;18(4):297–304. Esposito M, Saraceno R, Giunta A, Maccarone M, Chimenti S. An Italian study on psoriasis and depression. Dermatology. 2006;212(2):123–127. Esposito M, Faleri S, Babino G, et al. From patients’ needs to treatment outcomes in psoriasis: results from the ‘pSORRIDI’ experience. J Int Med Res. 2016;44(1 Suppl 1):95–99. Tham SN, Lim JJ, Tay Sh Chiew YF, Chua TN, Tan E, Tan T. Clinical observations on nail changes in psoriasis. Ann Acad Med Singapore. 1988;17(4):482–485. Baran R, de Berker DAR, Holzberg M, Thomas L, editors. Baran and Dawber’s Diseases of the Nail and Their Management. 4th ed. Wiley-Blackwell; 2012. Heydendael VM, De Borgie CA, Spuls PI, Bossuyt PM, Bos JD, De Rie MA. The burden of psoriasis is not determined by disease severity only. J Investig Dermatol Symp Proc. 2004;9:131–135. Reich K. Approach to managing patients with nail psoriasis. J Eur Acad Dermatol Venereol. 2009;23(Suppl 1):15–21. Pasch MC. Nail psoriasis: a review of treatment options. Drugs. 2016; 76:675–705. de Jong EM, Seegers BA, Gulinck MK, Boezeman JB, van de Kerkhof PC. Psoriasis of the nails associated with disability in a large number of patients: results of a recent interview with 1,728 patients. Dermatology. 1996;193(4):300–303. Lawry M. Biological therapy and nail psoriasis. Dermatol Ther. 2007;20(1):60–67. Armesto S, Esteve A, Coto-Segura P, et al. Nail psoriasis in individuals with psoriasis vulgaris: a study of 661 patients. Actas Dermosifiliogr. 2011;102(5):365–372. Spanish. McGonagle D, Ash Z, Dickie L, McDermott M, Aydin SZ. The early phase of psoriatic arthritis. Ann Rheum Dis. 2011;70(Suppl 1):i71–i76. Langley RG, Dauden E. Treatment and management of psoriasis with nail involvement: a focus on biologic therapy. Dermatology. 2010;221(Suppl 1):29–42. Klaassen KM, van de Kerkhof PC, Pasch MC. Nail psoriasis: a questionnaire-based survey. Br J Dermatol. 2013;169(2):314–319. Jiaravuthisan MM, Sasseville D, Vender RB, Murphy F, Muhn CY. Psoriasis of the nail: anatomy, pathology, clinical presentation, and a review of the literature on therapy. J Am Acad Dermatol. 2007;57(1):1–27. Langenbruch A, Radtke MA, Krensel M, Jacobi A, Reich K, Augustin M. Nail involvement as a predictor of concomitant psoriatic arthritis in patients with psoriasis. Br J Dermatol. 2014;171(5):1123–1128. Zaias N. Psoriasis of the nail. A clinical-pathologic study. Arch Dermatol. 1969;99(5):567–579. Rich P, Scher RK. Nail psoriasis severity index: a useful tool for evaluation of nail psoriasis. J Am Acad Dermatol. 2003;49(2):206–212. Szepietowski JC, Salomon J. Do fungi play a role in psoriatic nails? Mycoses. 2007;50(6):437–442. Rigopoulos D, Papanagiotou V, Daniel R 3rd, Piraccini BM. Onychomycosis in patients with nail psoriasis: a point to point discussion. Mycoses. 2017;60(1):6–10. Elewski BE. Onychomycosis: pathogenesis, diagnosis, and management. Clin Microbiol Rev. 1998;11(3):415–429. Zaias N, Escovar SX, Zaiac MN. Finger and toenail onycholysis. J Eur Acad Dermatol Venereol. 2015;29(5):848–853. Zisova L, Valtchev V, Sotiriou E, Gospodinov D, Mateev G. Onychomycosis in patients with psoriasis: a multicentre study. Mycoses. 2012;55(2):143–147. Mak RK, Hundhausen C, Nestle FO. Progress in understanding the immunopathogenesis of psoriasis. Actas Dermosifiliogr. 2009;100(Suppl 2):2–13. De Luca A, Zelante T, D’Angelo C, et al. IL-22 defines a novel immune pathway of antifungal resistance. Mucosal Immunol. 2010;3(4):361–373. Kisand K, Bøe Wolff AS, Podkrajsek KT, et al. Chronic mucocutaneous candidiasis in APECED or thymoma patients correlates with autoimmunity to Th17-associated cytokines. J Exp Med. 2010;207(2):299–308. Huppler AR, Conti HR, Herna´ndez-Santos N, Darville T, Biswas PS, Gaffen SL. Role of neutrophils in IL-17-dependent immunity to mucosal candidiasis. J Immunol. 2014;192(4):1745–1752. Kagami S, Rizzo HL, Kurtz SE, Miller LS, Blauvelt A. IL-23 and IL-17A, but not IL-12 and IL-22, are required for optimal skin host defense against Candida albicans. J Immunol. 2010;185(9):5453–5462. Goldminz AM, Au SC, Kim N, Gottlieb AB, Lizzul PF. NF-κB: an essential transcription factor in psoriasis. J Dermatol Sci. 2013;69(2):89–94. Rashmi R, Rao KS, Basavaraj KH. A comprehensive review of biomarkers in psoriasis. Clin Exp Dermatol. 2009;34(6):658–663. Di Meglio P, Perera GK, Nestle FO. The multitasking organ: recent insights into skin immune function. Immunity. 2011;35(6):857–869. Iyer SS, Cheng G. Role of interleukin 10 transcriptional regulation in inflammation and autoimmune disease. Crit Rev Immunol. 2012;32(1):23–63. Saulite I, Pilmane M, Kisis J. Expression of antimicrobial peptides in nail psoriasis and normal nails. Acta Derm Venereol. 2017;97(5):644–645. McGonagle D, Benjamin M, Tan AL. 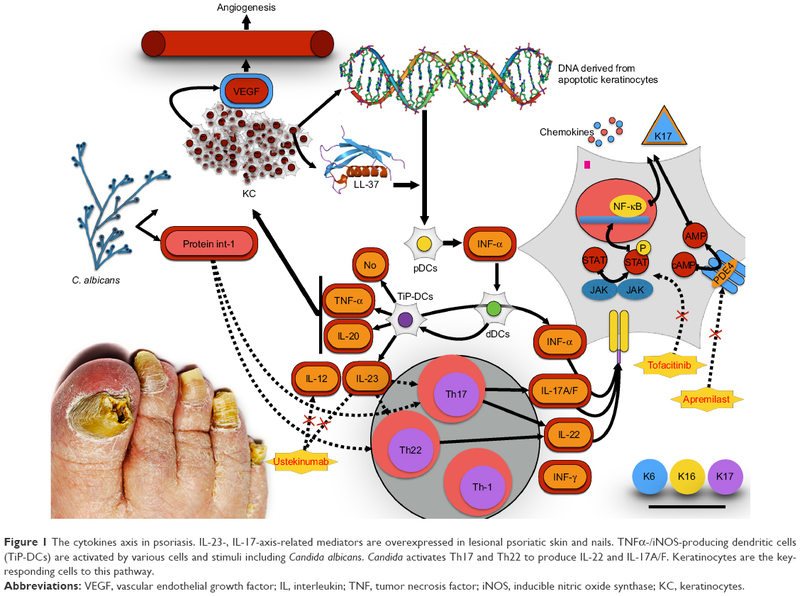 The pathogenesis of psoriatic arthritis and associated nail disease: not autoimmune after all? Curr Opin Rheumatol. 2009;21(4):340–347. Gniadecki R. Next-generation antipsoriatic drugs: small molecules join. Br J Dermatol. 2015;173(6):1355–1356. Crowley JJ, Weinberg JM, Wu JJ, Robertson AD, Van Voorhees AS; National Psoriasis Foundation. Treatment of nail psoriasis: best practice recommendations from the Medical Board of the National Psoriasis Foundation. JAMA Dermatol. 2015;151(1):87–94. Saggini A, Chimenti S, Chiricozzi A. IL-6 as a druggable target in psoriasis: focus on pustular variants. J Immunol Res. 2014;2014:964069. Manhart R, Rich P. Nail Psoriasis. Clin Exp Rheumatol. 2015;33:S7–S13. Marquez Balbas G, Sanchez Regana M, Umbert Millet P. Tacalcitol ointment for the treatment of nail psoriasis. J Dermatolog Treat. 2009;20(5):308–310. Reichrath J. Vitamin D and the skin: an ancient friend, revisited. Exp Dermatol. 2007;16(7):618–625. Scher RK, Stiller M, Zhu YI. Tazarotene 0.1% gel in the treatment of fingernail psoriasis: a double-blind, randomized, vehicle-controlled study. Cutis. 2001;68(5):355–358. Bianchi L, Soda R, Diluvio L, Chimenti S. Tazarotene 0.1% gel for psoriasis of the fingernails and toenails: an open, prospective study. Br J Dermatol. 2003;149(1):207–209. Campione E, Paternò EJ, Costanza G, et al. Tazarotene as alternative topical treatment for onychomycosis. Drug Des Devel Ther. 2015;9:879–886. Soda R, Diluvio L, Bianchi L, Chimenti S. Treatment of trachyonychia with tazarotene. Clin Exp Dermatol. 2005;30(3):301–302. Fischer-Levancini C, Sanchez-Regana M, Llambi F, Collgros H, Exposito-Serrano V, Umbert-Millet P. Nail psoriasis: treatment with tazarotene 0.1% hydrophilic ointment. Actas Dermosifiliogr. 2012;103(8):725–728. Spanish. Blauvelt A, Armstrong AW, Krueger GG. Essential truths for the care and management of moderate-to-severe psoriasis. J Drugs Dermatol. 2015;14(8):805–812. Gumusel M, Ozdemir M, Mevlitoglu I, Bodur S. Evaluation of the efficacy of methotrexate and cyclosporine therapies on psoriatic nails: a one-blind, randomized study. J Eur Acad Dermatol Venereol. 2011;25(9):1080–1084. Reich K, Langley RG, Papp KA, et al. A 52-week trial comparing briakinumab with methotrexate in patients with psoriasis. N Engl J Med. 2011;365(17):1586–1596. Sanchez-Regana M, Sola-Ortigosa J, Alsina-Gibert M, Vidal-Fernandez M, Umbert-Millet P. Nail psoriasis: a retrospective study on the effectiveness of systemic treatments (classical and biological therapy). J Eur Acad Dermatol Venereol. 2011;25(5):579–586. Demirsoy EO, Kiran R, Salman S, et al. Effectiveness of systemic treatment agents on psoriatic nails: a comparative study. J Drugs Dermatol. 2013;12(9):1039–1043. Syuto T, Abe M, Ishibuchi H, Ishikawa O. 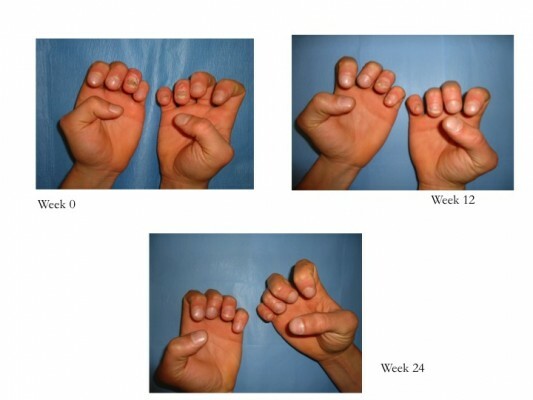 Successful treatment of psoriatic nails with low-dose cyclosporine administration. Eur J Dermatol. 2007;17(3):248–249. Karanikolas GN, Koukli EM, Katsalira A, et al. Adalimumab or cyclosporine as monotherapy and in combination in severe psoriatic arthritis: results from a prospective 12-month nonrandomized unblinded clinical trial. J Rheumatol. 2011;38(11):2466–2474. Ricceri F, Pescitelli L, Tripo L, Bassi A, Prignano F. Treatment of severe nail psoriasis with acitretin: an impressive therapeutic result. Dermatol Ther. 2013;26(1):77–78. Tosti A, Ricotti C, Romanelli P, Cameli N, Piraccini BM. Evaluation of the efficacy of acitretin therapy for nail psoriasis. Arch Dermatol. 2009;145(3):269–271. Pirowska MM, Goździalska A, Lipko-Godlewska S, et al. Autoimmunogenicity during anti-TNF therapy in patients with psoriasis and psoriatic arthritis. Postepy Dermatol Alergol. 2015;32(4):250–254. Bianchi L, Bergamin A, de Felice C, Capriotti E, Chimenti S. Remission and time of resolution of nail psoriasis during infliximab therapy. J Am Acad Dermatol. 2005;52(4):736–737. Rigopoulos D, Gregoriou S, Lazaridou E, et al. Treatment of nail psoriasis with adalimumab: an open label unblinded study. J Eur Acad Dermatol Venereol. 2010;24(5):530–534. Barrera MV, Habicheyn S, Mendiola MV, Herrera Ceballos E. Etanercept in the treatment and retreatment of psoriasis in daily clinical practice. Eur J Dermatol. 2008;18(6):683–687. Rallis E, Stavropoulou E, Rigopoulos D, Verros C. Rapid response of nail psoriasis to etanercept. J Rheumatol. 2008;35(3):544–545. Coelho JD, Diamantino F, Lestre S, Ferreira AM. Treatment of severe nail psoriasis with etanercept. Indian J Dermatol Venereol Leprol. 2011;77(1):72–74. Mease PJ, Fleischmann R, Deodhar AA, et al. Effect of certolizumab pegol on signs and symptoms in patients with psoriatic arthritis: 24-week results of a Phase 3 double-blind randomised placebo-controlled study (RAPID-PsA). Ann Rheum Dis. 2014;73(1):48–55. Park H, Li Z, Yang XO, et al. A distinct lineage of CD4 T cells regulates tissue inflammation by producing interleukin 17. Nat Immunol. 2005;6(11):1133–1141. Cai Y, Fleming C, Yan J. Dermal γδ T cells – a new player in the pathogenesis of psoriasis. Int Immunopharmacol. 2013;16(3):388–391. Rich P, Bourcier M, Sofen H, et al; PHOENIX 1 investigators. Ustekinumab improves nail disease in patients with moderate-to-severe psoriasis: results from PHOENIX 1. Br J Dermatol. 2014;170(2):398–407. Rigopoulos D, Gregoriou S, Makris M, Ioannides D. Efficacy of ustekinumab in nail psoriasis and improvement in nail-associated quality of life in a population treated with ustekinumab for cutaneous psoriasis: an open prospective unblinded study. Dermatology. 2011;223(4):325–329. Patsatsi A, Kyriakou A, Sotiriadis D. Ustekinumab in nail psoriasis: an open-label, uncontrolled, nonrandomized study. J Dermatol Treat. 2013;24(2):96–100. Igarashi A, Kato T, Kato M, Song M, Nakagawa H; Japanese Ustekinumab Study Group. Efficacy and safety of ustekinumab in Japanese patients with moderate-to severe plaque-type psoriasis: long-term results from a phase 2/3 clinical trial. J Dermatol. 2012;39(3):242–252. Yao Z, Painter SL, Fanslow WC, et al. Human IL-17: a novel cytokine derived from T cells. J Immunol. 1995;155(12):5483–5486. Gaffen SL. The role of interleukin-17 in the pathogenesis of rheumatoid arthritis. Curr Rheumatol Rep. 2009;11(5):365–370. Langley RG, Rich P, Menter A, et al. Improvement of scalp and nail lesions with ixekizumab in a phase 2 trial in patients with chronic plaque psoriasis. J Eur Acad Dermatol Venereol. 2015;29(9):1763–1770. Thaçi D, Kimball A, Foley P, et al. Apremilast, an oral phosphodiesterase 4 inhibitor, improves patient-reported outcomes in the treatment of moderate to severe psoriasis: results of two phase III randomized, controlled trials. J Eur Acad Dermatol Venereol. 2016;31(3):498–506. Papp K, Reich K, Leonardi CL, et al. Apremilast, an oral phosphodiesterase 4 (PDE4) inhibitor, in patients with moderate to severe plaque psoriasis: results of a phase III, randomized, controlled trial (Efficacy and Safety Trial Evaluating the Effects of Apremilast in Psoriasis [ESTEEM] 1). J Am Acad Dermatol. 2015;73(1):37–49. Rich P, Gooderham M, Bachelez H, et al. Apremilast, an oral phosphodiesterase 4 inhibitor, in patients with difficult-to-treat nail and scalp psoriasis: results of 2 phase III randomized, controlled trials (ESTEEM 1 and ESTEEM 2). J Am Acad Dermatol. 2016;74(1):134–142. Papp KA, Menter MA, Abe M, et al; OPT Pivotal 1 and OPT Pivotal 2 investigators. Tofacitinib, an oral Janus kinase inhibitor, for the treatment of chronic plaque psoriasis: results from two randomized, placebo-controlled, phase III trials. Br J Dermatol. 2015;173(4):949–961. Fénix-Caballero S, Alegre-del Rey EJ, Castaño-Lara R, Puigventós-Latorre F, Borrero-Rubio JM, López-Vallejo JF. Direct and indirect comparison of the efficacy and safety of adalimumab, etanercept, infliximab and golimumab in psoriatic arthritis. J Clin Pharm Ther. 2013;38(4):286–293. Thorlund K, Druyts E, Aviña-Zubieta JA, Mills EJ. Anti-tumor necrosis factor (TNF) drugs for the treatment of psoriatic arthritis: an indirect comparison meta-analysis. Biologics. 2012;6:417–427. Bierman AS, Tinetti ME. Precision medicine to precision care: managing multimorbidity. Lancet. 2016;388(10061):2721–2723.